Father Damian Kuolt and his wife Matushka Joanna have recently moved to Bend in order to serve as our full-time priest and pastor. As a community of believers, we are very happy that under their leadership we can provide weekly Divine Services, catechesis, inquirer classes, Bible study and outreach to those who are seeking the Truth. “I welcome everyone to discover the life of the Church as handed down to us from the time of the Apostles. As a new arrival in Bend, I am devoted to sharing the Orthodox faith and spiritual life that leads to transformation. Each of us are created in the image and likeness of God, yet being born into a fallen world leaves us in need of the restoration of these divine attributes. This is the work of salvation, of ‘adoption’. But it requires us to exercise our free will and choose the Way of Life in cooperation with the Grace of God. To every seeker, no matter where they are in this journey, I say, “Come, ‘taste and see’ that the Lord is good”! Archpriest Damian Kuolt has helped with mission parishes through the Diocese of the West, and is now newly located in Bend Oregon to serve St. Jacob parish . . . the only Eastern Orthodox Christian Church in Central Oregon. Fr. Damian has spent his whole adult life serving Christ. After attending the United States Airforce Academy, he met his wife of 45 years and they began a journey that led to the Orthodox Church. He has worked as an EMT, in hospitals, in a men’s homeless shelter, as a group home leader for the mentally challenged, as Co-Director of Raphael House in San Francisco and Boise, Idaho. Fr. Damian’s service ultimately led him to Holy Orthodoxy. He attended Mount Angel Benedictine Seminary, prior to his ordination to the priesthood. He was instrumental in the founding of Annunciation Orthodox Church, Milwaukie OR. His ministry as an OCA priest has been primarily in the arena of missions, building and reinvigorating small parishes, preparing parishes to step-up to obtaining and supporting a fulltime priest, and other ‘immediate response’ situations throughout the Diocese of the West. Having raised four children who embrace Orthodoxy, he and his wife have lived in the challenges facing youth and how to advocate a life in Christ at each stage of their development. Fr. Damian is always looking for the way that the Holy Spirit leads those around him to be effective in their own lives, using the experiences of great men and the Fathers old and new, to bring others to Christ. 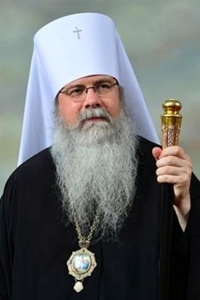 It is his hope to make Orthodoxy alive for each Orthodox Christian, as it is his belief that every Orthodox Christian is called to reach those who are ‘across the threshold’ of the Church, demonstrating a love for God and our neighbor to each person he reaches. Fr. Damian currently serves on the Diocesan Council of the Diocese of the West, as its Secretary and on the Advisory Council for the Diocese.